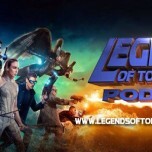 On this week’s episode of the Legends of Tomorrow Podcast Amy, Lauren, Morgan, and Kat get together to review the fifteenth episode of DC’s Legends of Tomorrow titled “Destiny”. In addition, they read listener feedback and e-mails about “Destiny”. That and more on this week’s episode of the Legends of Tomorrow Podcast! Also, make sure to check out our WonderCon roundtable videos with the cast and crew of Legends of Tomorrow! DC’S LEGENDS OF TOMORROW stars Victor Garber (“The Flash,” “Alias”), Brandon Routh (“Arrow,” “Superman Returns”), Arthur Darvill (“Doctor Who”), Caity Lotz (“Arrow”), Ciara Renee (“Pippin”), and Franz Drameh (“Edge ofTomorrow”), with Dominic Purcell (“The Flash,” “Prison Break”) and Wentworth Miller (“The Flash,” “Prison Break”).